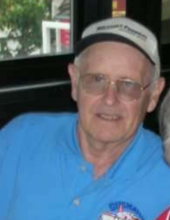 Donald D. Donahue, 83 of Oglesby died at 6:45 a.m. November 10, 2018 Illinois Valley Comm. Hospital, Peru. Cremation rites will be accorded. There will be no services or visitation. Shields Funeral Chapel, Oglesby is in charge of arrangements. Don was born April 13, 1935 in Ottawa to Bernard and Elmira (Collins) Donahue. He married Shirley Brinovec August 8, 1959 in St. Hyacinth’s Church. Don worked as a machinist at Libby Owens.He was a member of Holy Family Church where he served as an usher. He was a member of the Holy Name Society and the Oglesby Elks where he was a bingo worker for many years. Later Don drove a bus for LaSalle-Peru Township High School sports teams. Don also served in the Illinois National Guard. He is survived by his wife Shirley of Oglesby, 4 sons; Jeffrey of LaSalle, Steven (Nicholas Poulos) of Ashville, N.C., Mark (Cindy) of Kingsville, TX and Greg of Minier, IL, a daughter Kathleen of Ft. Worth, TX and a grandson Brian. He was preceded in death by 2 brothers, a sister and a grandson Andrew. In lieu of flowers, memorials may be directed to Horizon House. To send flowers or a remembrance gift to the family of Donald D. Donahue, please visit our Tribute Store. "Email Address" would like to share the life celebration of Donald D. Donahue. Click on the "link" to go to share a favorite memory or leave a condolence message for the family.